Editor/Author Smith, Russell G., Cheung, Ray, and Chak-Chung, Lau et. al. 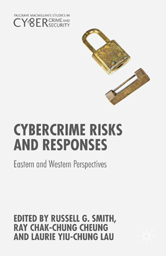 This book examines the most recent and contentious issues in relation to cybercrime facing the world today, and how best to address them. The contributors show how Eastern and Western nations are responding to the challenges of cybercrime, and the latest trends and issues in cybercrime prevention and control.